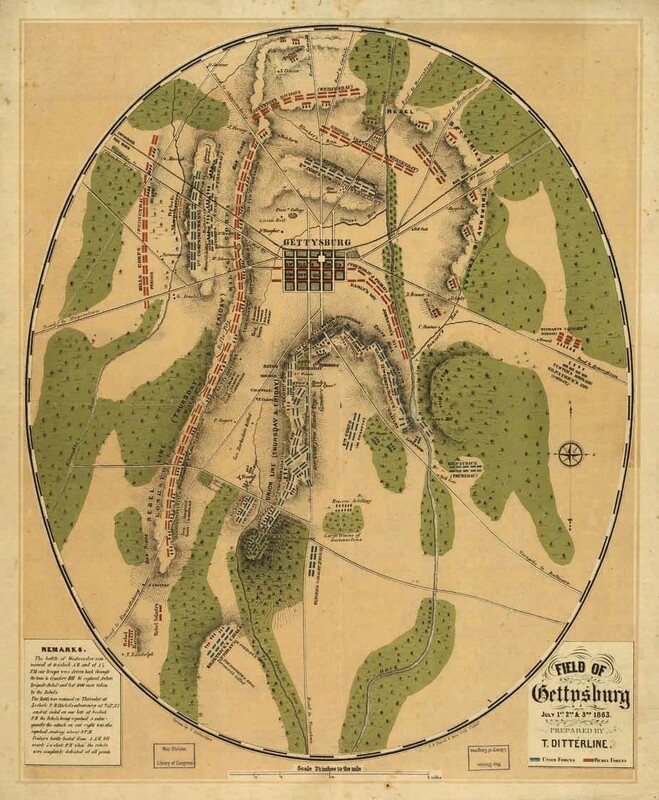 All three days of the battle of Gettysburg are captured in Ditterline's map (above), the top of which faces north. Red represents the Confederate positions and blue represents the Union positions. Day one is shown in the upper left and a few sections at the top. Day two is shown as the large red line on the left side that seems to hook around the upper part of the town as well as through it. Day three events occur to the south of town with the major events focusing on the small blue fish-hook shape. 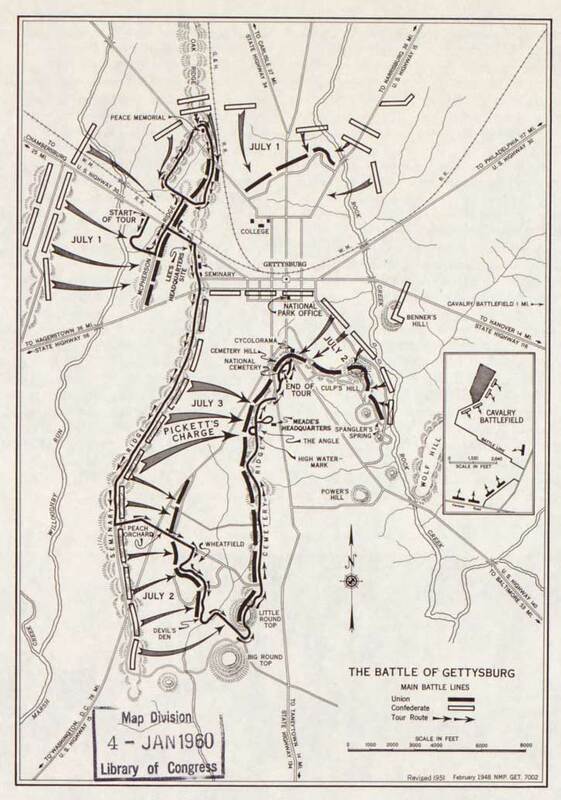 Battle of Gettysburg map used by the National Park Service in the early 1960s to show the Confederate and Union positions July 1, 2nd, and 3rd, 1863. Union positions are marked by the black bars. Battle of Gettysburg day one, July 1st, 1863, began as a small skirmish, but it escalated quickly as nearby regiments responded to the sound of firearms and converged on Gettysburg. 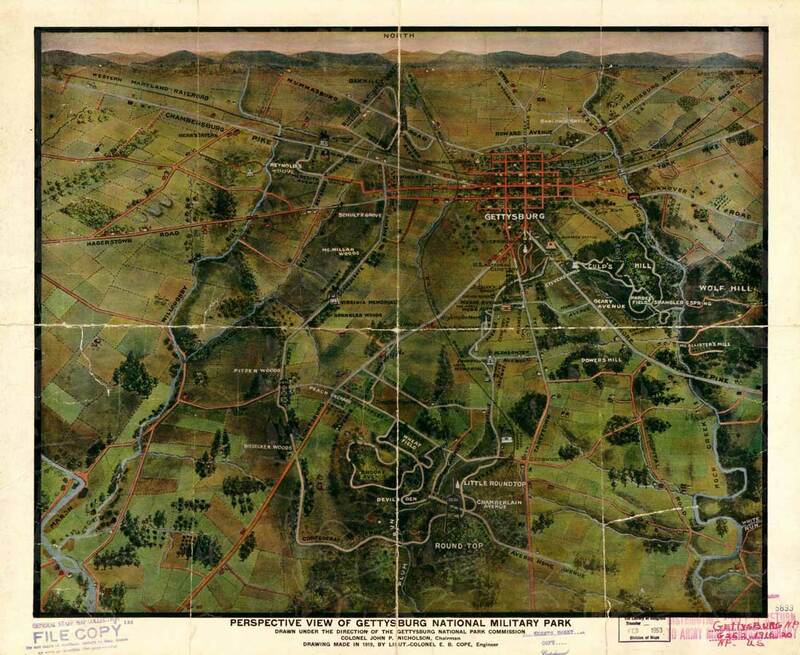 All the major roads in the area led to Gettysburg. (left) Lutheran Theological Seminary c 1900. (right) View from Seminary cupola looking west toward the distant trees, perhaps the same view General Buford may have seen Confederate troops. 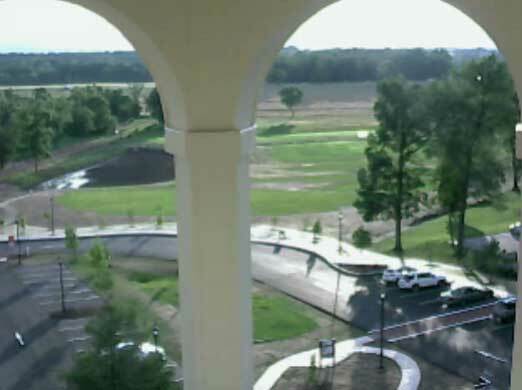 This view comes from The York Daily News cam mounted in the cupola for the 150th celebration of the Gettysburg Battle and the opening of the Seminary Ridge Museum July 1, 2013. Union General John Buford, a native of Kentucky who opted to fight for the United States union rather than the southern cause, had arrived in the area first to provide reconnaissance for General George Meade. Buford surveyed the landscape from cupola of the Lutheran Seminary and about 8 in the morning saw Confederates coming out of the woods from west from Chambersburg, Pennsylvania. 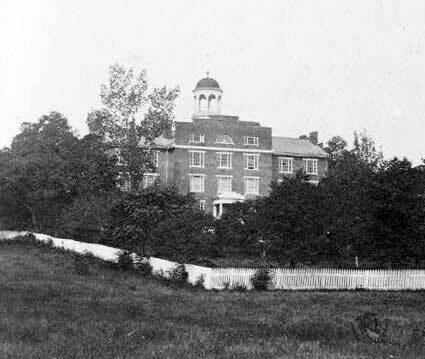 The Lutheran Theological Seminary, now the Adams County Historical Society and home of the Seminary Ridge Museum, was a hospital during and after the battle for both Confederate and Union armies. A warning shot fired by Yankee sentry Marcellus Jones to alert his comrades became the beginning moment of the battle; he noticed a trail of dust and shot at whom he thought was a Rebel officer. Yankee was the nickname Southern soldiers used when referring to Union soldiers. Rebels was the nickname for Southern soldiers from the rebellious states. Rebel came from the word rebellion. General Buford had observed from the cupola that the key to the area was having possession of high ground, especially to the south of town. So his objective was to hold off the Confederate advance, defend and hold Seminary Ridge until replacements could arrive. The first part of the battle occurred between Herr's Ridge and the Seminary. The Confederates also began to emerge from the north forming a half circle to the town of Gettysburg. Both sides tried to get reinforcements to the area as soon as possible. General John Reynolds and his infantry troops arrived on the scene near the Theological Seminary, but he was killed early in battle. General Buford's men with Sharps, Burnsides and other breech-loading rifles were able to check the advance of the Confederates who had to stand and reload their muskets. General Buford had less than 2700 cavalry, but checked the advance of the Confederate infantrymen, eventually numbering about 7600. About noon the fighting subsided for couple of hours. Then around 2:30 the silence was broken and firing started again. Confederates pushed forward from the north and west; by then, they had more reinforcements and pushed the Union troops back to McPherson Ridge, a slight swell in the landscape. General Lee arrived about 2:30 or 3:00 pm; General Mead, newly appointed commander of Union troops, was not yet in the area. The Union troops then fell back to the Theological Seminary at Seminary Ridge. The South Carolinians were given the order to charge no matter the cost, and they flooded over landscape swell causing the Union troops to retreat further back through the town. At about 4:30, the Confederates occupied the town and raised their flag. The Confederates pushed the Union Army from the northwest of Gettysburg back through town and unfortunately onto higher ground to Cemetery Hill, a part of Cemetery Ridge, south of town. 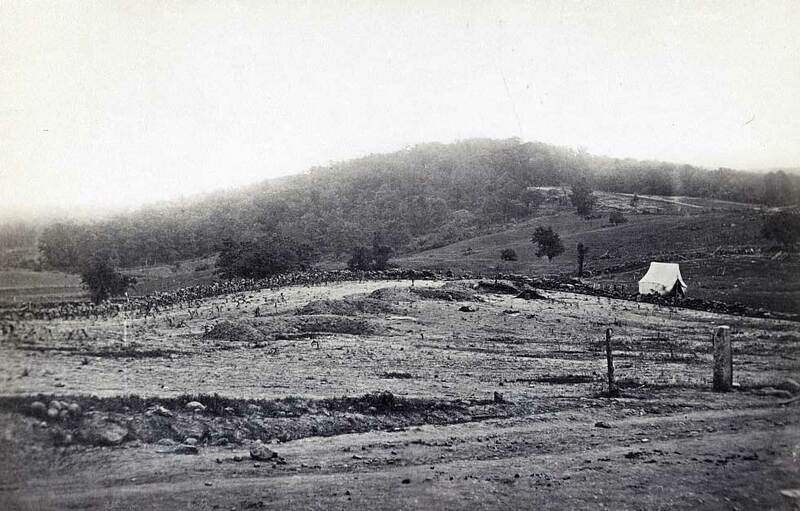 During the night, the Union Army reinforced its position on Culp's Hill (above, as seen from Cemetery Hill; right,Culp's Hill summit) and along Cemetery Ridge and formed a fishhook-shaped defensive line. On the first day there were 16,000 casualties; over the course of the battle there were about 50,000 casualties. Many houses and out buildings around town became hospitals. Battle of Gettysburg day two, the Union Army held its position even though the Confederates fought intensely on the Union’s flanks at Devil's Den, Little Round Top, Wheatfield, Peach Orchard, Culp's Hill and East Cemetery Hill. During the night of Day One and into Day Two, other brigades and regiments of both the Union and Confederate armies converged on Gettysburg. Meade arrived early in the morning. Fighting for the time had subsided. The Confederates extended in a line through the town of Gettysburg, south along Seminary Ridge down through the Peach Orchard located on the west side of Emmitsburg Road. The Union began to form a line, almost parallel but shorter, that extended from Culp's Hill just outside southeast Gettysburg, then south along Cemetery Ridge to Little Round Top. Cemetery Ridge terminates in the area Little Round Top and next to Big Round Top further south. 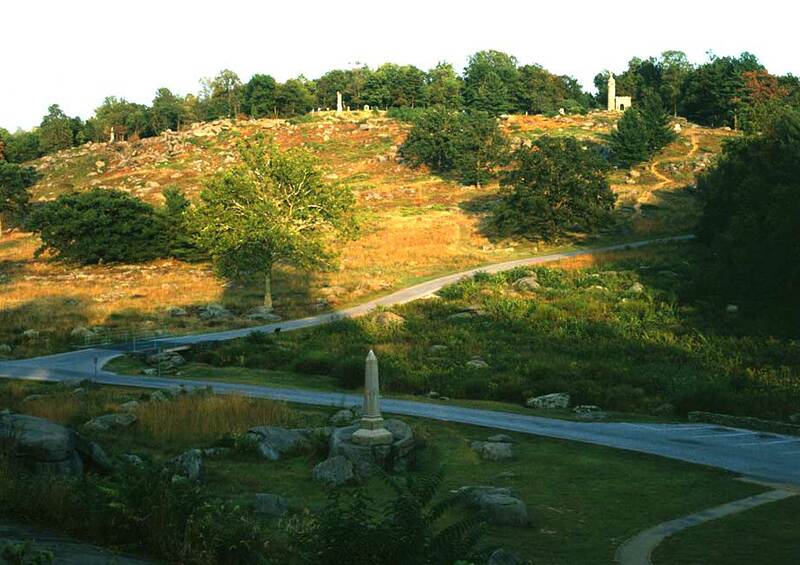 Just across from Little Round Top and a small valley is an area called Devil's Den. This is an area at the base of the hill where there are huge boulders and rocky outcroppings. 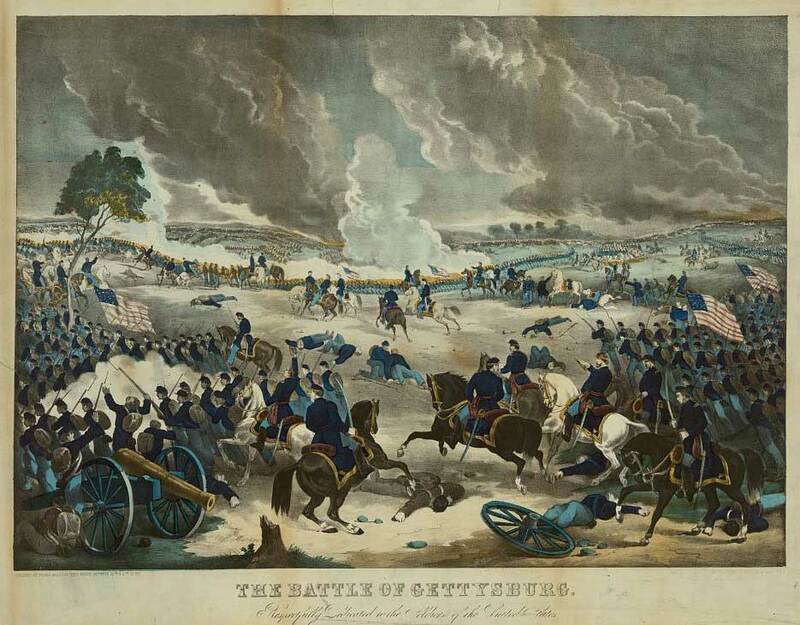 Big Round Top was not used much in the battle. Positioning artillery there was hard because of the thick woods and rough ground. In essence, the Union was positioned on high ground in a tight fishhook shape and could easily send reinforcements where they were needed. The Confederates were more spread out in a loose-shape hook formation where communication over the vast distance was harder. Fighting began in the late afternoon about 4 pm with Lee attacking Meade's flanks. Lee wanted to attack earlier but General James Longstreet, whom Lee had put in charge of the attacks, had waited and delayed the attack—the reasons why are only speculation and buried in history—which allowed the Union troops rally and further reinforce positions. In any event, Lee's strategy was to force Meade to divide his troops to protect the ends instead of focusing in one area. So the main fighting took place at the two ends of the fish hook at Devil's Den on the southern end and over by Culp's Hill at the northern end. At the same time, a lesser attack on the Union center was initiated to keep the Union from reinforcing the ends, but it was a weak attempt and ineffective. c. 1950s panoramic map by the National Park Service with Round Top in the foreground showing roads, railroads, field patterns, woodland, observation towers, monuments and houses. The observation tower was removed in 2000. The white cross lines are fold marks from the map's use over the years; the center of the fold though marks the area where intense fighting occurred on Day Three as Generals Longstreet and Pickett charged the Union's center. At the north end of the fishhook, the Confederates could not conquer Culp's Hill and were stopped by artillery firing down then hill. 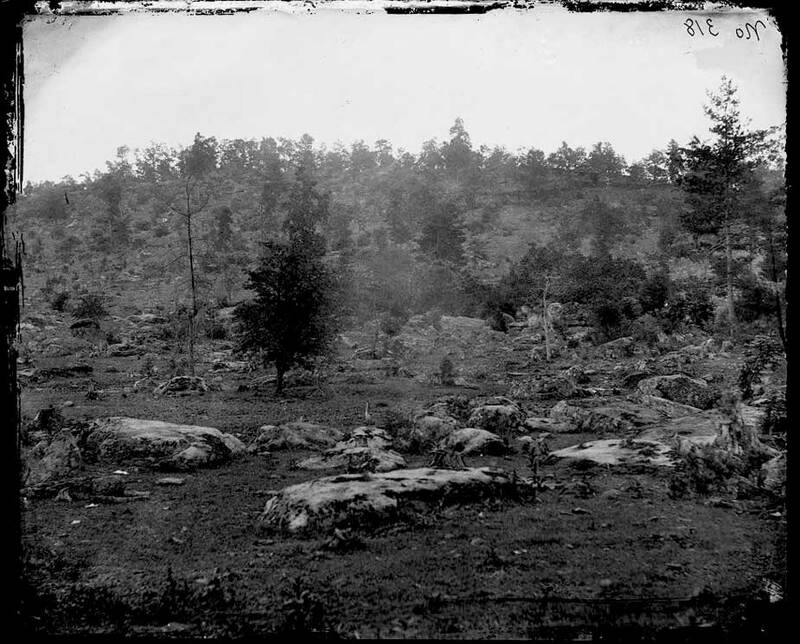 However, the Confederates were successful at routing out Union troops from Devil's Den at the south end of the fish hook, but then tried unsuccessfully to get up the face of Little Round Top. Failing at that, the Confederates then moved around and up the hill in the early evening, about 7 pm; however, Joshua Chamberlain and the 20th Maine stopped them. Meade's fishhook had held up. 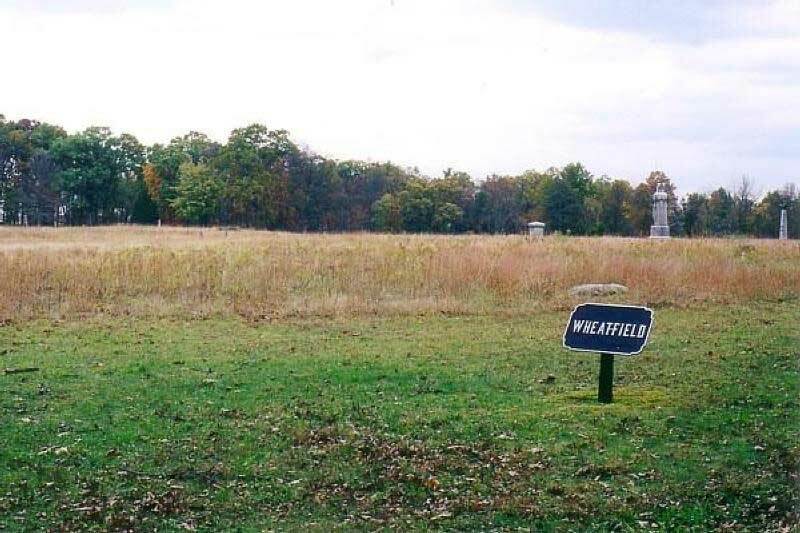 During the attacks on the Union lines, Longstreet also tried to go through the Wheat Field (below), farmland right next to Devil's Den between Cemetery Ridge and Little Round Top. The Confederates almost gained advantage there when Union General Dan Sickels disobeyed orders and moved forward without Meade's permission, almost to the Peach Orchard about a mile from the Union line, leaving large gaps in Meade's fish hook. The Rebels pounded Sickles' Yankees; fighting in the Wheat Field-Peach Orchard area went back and forth. Dead and wounded soldiers and horses littered the area. Longstreet who had started the day commanding about 14000 men lost about 6000 men there alone. General Winfield Scott Hancock of 2nd corp recognized the gaps in the Union line and with the 2rd and 5th corps was able to plug the holes, but not without heavy losses almost against all odds. Total casualties for Day Two were about 23000. Lee wanted to win a victory on Northern soil to depress and terrify the North to the point where they would concede. Gettysburg was not the place Lee imagined his northern invasion battle to occur, but it is the place that encounter was realized. In the early morning of day three of the battle of Gettysburg about 4 am, Lee directed General Richard Stoddert Ewell, who had led the attack on Culp's Hill on Day Two, to attack the hill again. The engagement lasted for six to seven hours, but Ewell failed and pulled back. If Culp's Hill had been taken, the Confederates would have had control of the high ground in the area and be able to rain artillery fire onto Union positions. Also, from that vantage point Lee could have gained control of Baltimore Pike and the Union supply line. In the early afternoon, the two armies began to exchange massive artillery fire—138 Confederate guns in a line from the Peach Orchard to the Seminary dueled with the Union's eighty cannons on Cemetery Ridge. Longstreet commanded Generals Isaac Trimble, J. Johnston Pettigrew and George Pickett forward. Their units, spread rank-and-file out in a line over half-mile wide, needed to move about a mile through an open field and over a stone wall. 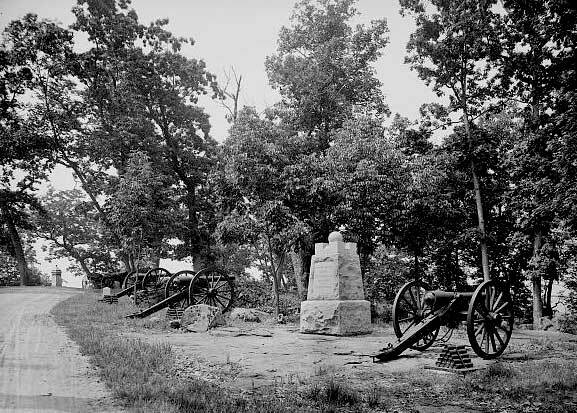 The Confederate Army infantry attacked the Union's center on Cemetery Hill in close proximity to General Meade's headquarters. 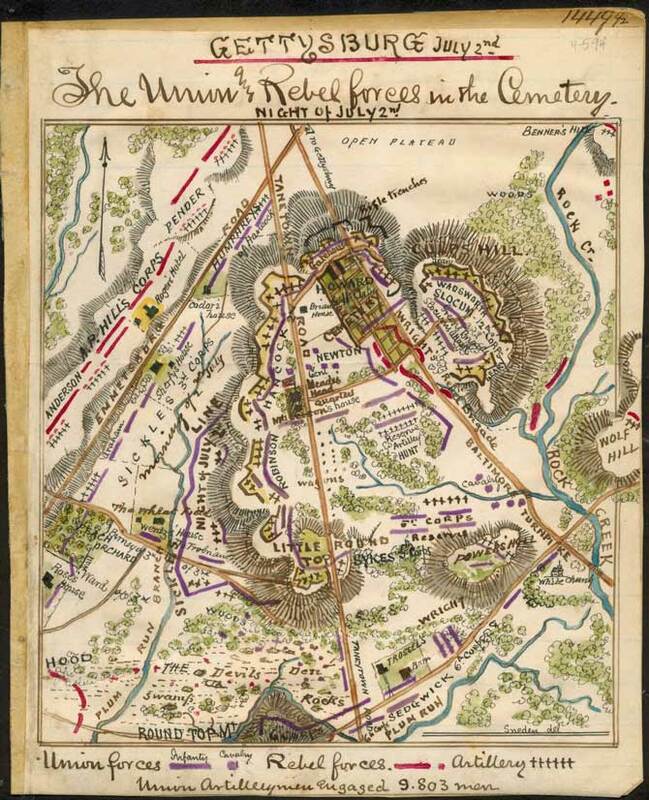 The Union's volley came from the front and sides as the two armies collided decimating the Confederate rank-and-file. General Picket spearheaded a charge, known as Pickett’s Charge, where by about a hundred men briefly penetrated the Union Army line, but were driven back. Realizing his weakened position, Lee retreated into Virginia on July 4th. 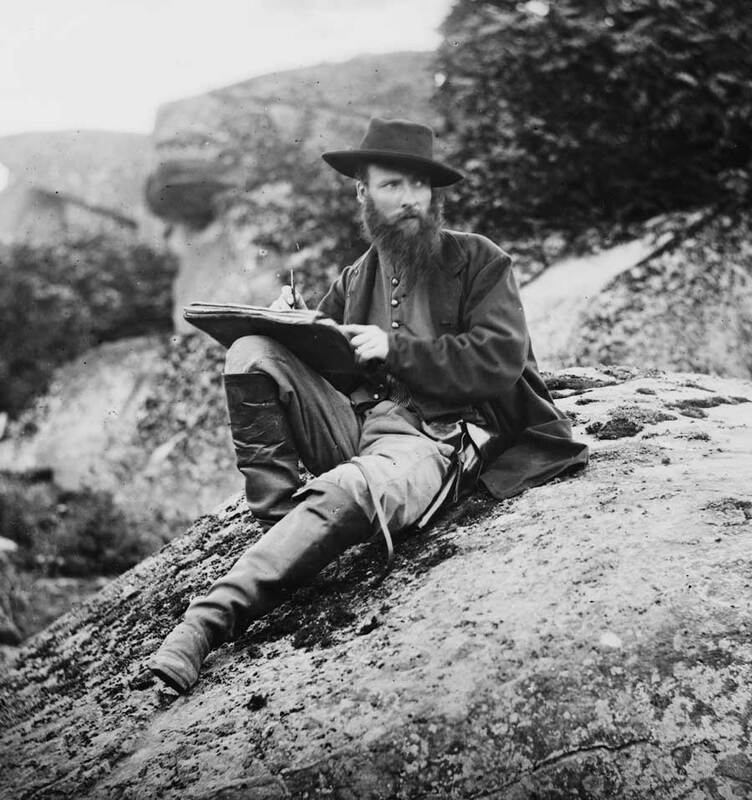 (left) Artist Alfred Waud was photographed by Timothy O'Sullivan sketching in Devil's Den after the Battle of Gettysburg. Artist illustrators were an important method to describing the war in publications, for example the New York Illustrated News, Harper's Weekly or Frank Leslie's Illustrated Newspaper. 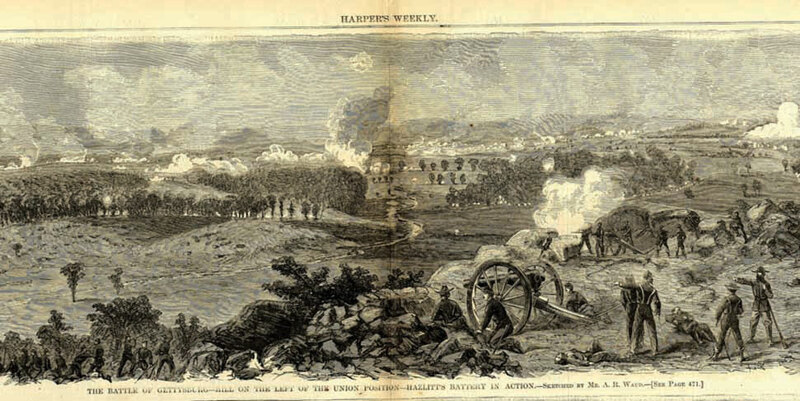 Many of his drawings can be viewed online in the Civil War collection of the Library of Congress.